So you have this drawing, and despite clearing our your Annotative Scale List, running the PURGE command, even clearing out your layer filters the gosh darn drawing is still slower than a herd of turtles stampeding through peanut butter. And even after all of that, your drawing is still 1 MB in size – what gives? The issue is most likely due to these little things known as regapp ID’s which can lurk in a drawing and substantially impact drawing performance. The term regapp is actually short for registered application. The basic premise of these so called regapps is a connection is made between AutoCAD and some external applications (ie AutoLISP, ObjectARX, .NET, etc). When this connection is no longer needed, a regapp of that former connection is retained inside the AutoCAD DWG database. Thankfully getting rid of these unreferenced regapps is rather simple. Being one of AutoCAD’s best kept secrets, the hardest thing is just knowing about them. The secret to getting rid of these is the command line version of the -PURGE command (note the hyphen). If you type –PURGE at the command line, you can then specify R for RegApps. Finishing the command will subsequently remove these unecessary objects from your drawing. Now save and watch your file shrink! The above method is great if all you have is a couple drawings to purge the RegApps from. 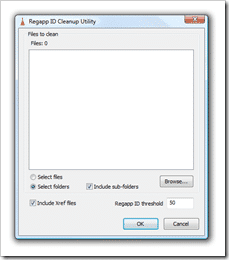 Autodesk recently posted a Regapp ID Cleanup Utility which will allow you to remove these pesky things from multiple drawings at once. 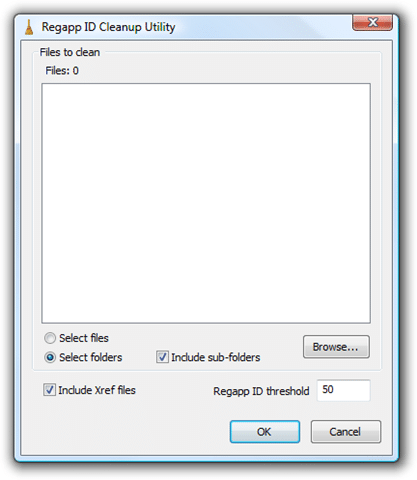 I purge my regapps (23,000) and I save, and then when I reopen my file they are back….that is, when I run the command again, it deletes the same number of regapps. What is causing this? is there a way to delete them forever? Jeff – I too work in an LDT/C3D environment and have not had any any problems with this procedure. While most of them are created by LDT/C3D, there no longer in use. Getting rid of them won’t hurt anything, as LDT/C3D will just recreate what it needs at a later date. Will removeing ALL the registered applications cause issues with LDT, Map, C3D and other programs like them? I tried it on a relatively small drawing and it found 33 of them.